We updated WordPress (the platform that powers this blog) late in August to version 3.0.1. Below is a 3 1/2 minute screencast describing some of the new features introduced in this new version. 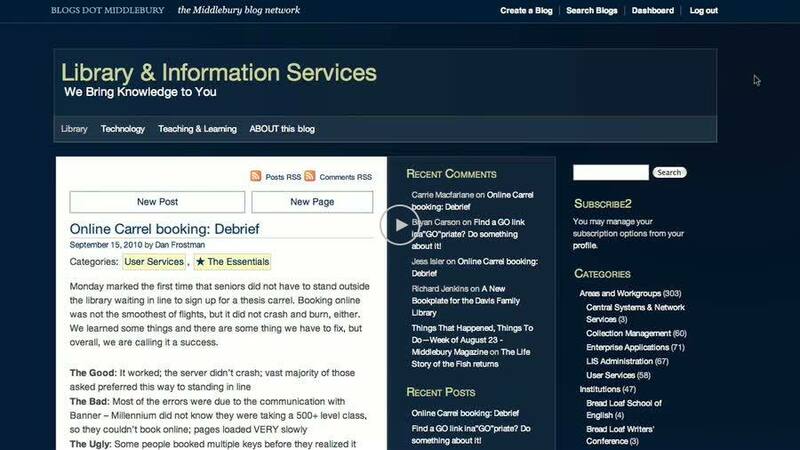 To learn more about these new features, see: WordPress @ Middlebury > WordPress Updates. This entry was posted in LIS Staff Interest and tagged Curricular Technology, Enterprise Applications, LIS Website, WordPress on September 17, 2010 by Alex Chapin. Nice! I like the screencast, too. One note on the screencast – I was unable to view the screencast off-campus. If I use VPN, I can see it without issues. But without VPN I can’t see it. Petar, let us know if you have any other trouble-shooting info (browser, OS, service provider, any sort of browser error log). I just tried it from home via Comcast w/ Firefox 3.6.8 and didn’t have any problem watching without using the VPN.